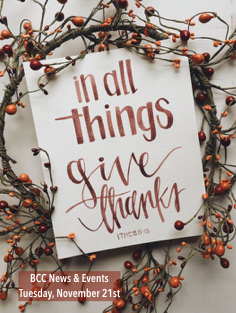 The church office will be closed in observance of Thanksgiving from Wednesday, November 22nd until Friday, November 24th. We will not be holding Care Network, Wednesday, November 22nd. In addition, there will be no Early Weekend Service on Thursday, November 23rd in observance of Thanksgiving Day. More than 700 million people in developing countries live on less than $1.90 per day, facing challenges most Americans never will. Experience another world without leaving yours. The Compassion Experience is making a five-day stop at BCC, November 30-December 4. This interactive tour will bring visitors on a journey into the lives of two Compassion-sponsored children living in Kenya, and the Dominican Republic. You don’t want to miss this event. To register or volunteer go to https://cts.compassion.com/events/930. Join us Tuesday, December 12th from 8 AM to 4 PM, where we’ll take a bus to Billy Graham Library in Charlotte for a tour & lunch. Please register for the Billy Graham Library by December 1st. To RSVP or for any questions, contact: Jean Willoughby, 828.329.4000 or jeanbwilloughby@yahoo.com. The Preschool Ministry is excited to is launch a New and Expectant Parent Ministry. We will have more information for you very soon! If you are expecting, or are a new parent, we would love to be a support to you. Please send your name, contact information, and month due to Dawn Burgess, Preschool Director, at dawn@brevardcommunity.org.